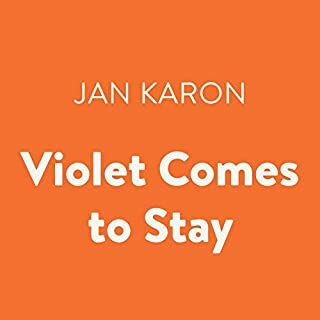 Jan Karon's legions of fans will love this timeless story about the endearing white kitten named Violet, charmingly written by Melanie Cecka. Ms. Karon searched for three years to find a storytelling voice authentic to Cynthia Coppersmith. She was personally involved in every step of the creation of this book. A Miracle for St. Cecilia’s is a heartwarming story that all lovers of Christian fiction will find uplifting and entertaining. St. Cecilia’s, an old, outdated Catholic Church in a small New England town, is about to be closed down, much to the dismay of the faithful townsfolk. What will become of Father James Flaherty and the aging Father Keene - and what of the flock? When faith and hope endure, even miracles are possible. 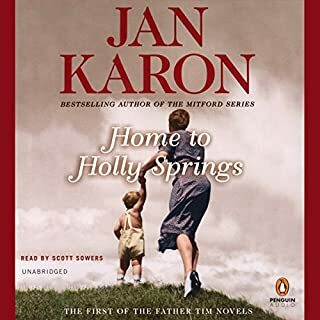 Number-one New York Times best-selling author Jan Karon returns - with the story listeners have been waiting for. Over the course of 10 Mitford novels, fans have kept a special place in their hearts for Dooley Kavanagh, first featured in At Home in Mitford as a barefoot, freckle-faced boy in filthy overalls. Now, Father Tim Kavanagh's adopted son has graduated from vet school and opened his own animal clinic. Since money will be tight for a while, maybe he and Lace Harper, his once and future soul mate, should keep their wedding simple. So, the plan is to eliminate the cost of catering and do potluck. Ought to be fun. And, once mucked out, the barn works as a perfect venue for seating family and friends. 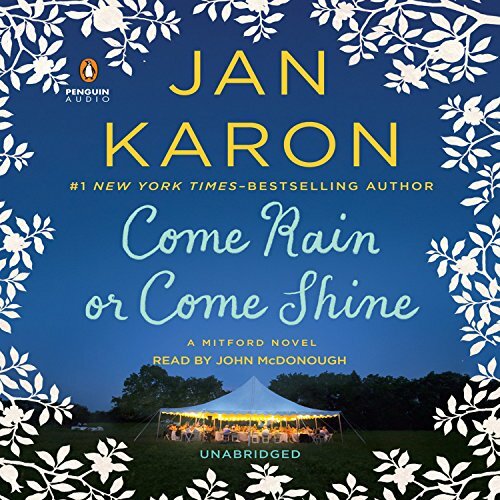 In Come Rain or Come Shine, Jan Karon delivers the wedding that millions of Mitford fans have waited for. It's a June day in the mountains, with more than a few creatures great and small, and you're invited - because you're family. By the way, it's a pretty casual affair, so come as you are and remember to bring a tissue or two. After all, what's a good wedding without a good cry? Let me start by saying up front that I am not a fan of romance stories and/or books about big wedding craziness so I was wary of this book. What's more I was not wild about book #10 in the series (see my review from last year for more about that if you are interested) so I almost didn't try this book. I confess I even went back and reread #10--Somewhere Safe With Somebody Good--giving it a second chance. I thought I might have gotten it all wrong. As Karon herself says in that book--we can never read the same book twice because we change and see things differently with each reading. After the reread I'm afraid I still stand by what I said in my review--that book just wasn't my favorite. However, all that said, Come Rain or Come Shine is a total gem! I am really glad that I didn't skip this entry in the series. This book is a wonderful return to the style and tone of earlier, beloved books in the Mitford collection. John McDonough's narration was excellent, restrained and subtle. Cynthia and Fr Tim often joke and refer to themselves as "book ends"--well to me--Come Rain or Come Shine is a perfect "book end" for the first book in the series--At Home In Mitford. I won't say another word because I don't want to spoil the story. Just know I thought it was perfection. I just loved it. 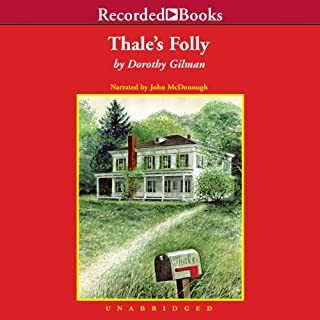 The story about Dooley's and Lace's wedding had all of the hallmarks of the previous Father Tim books. She continued to develop the main characters and many of the supporting cast as well. All of the family story lines are still there and there's room for more. Fortunately the narrator is still John McDonagh, Who fits the role precisely. Perhaps that's because he created that role in the audio form. The story is well done and leaves the door open for future developments. I hope Jan Karon decides to continue the series. If she does not, I might be tempted to start the series over at some point. There's never any real tension or high drama action in any of the books, but they're such a pleasant, diversionary read that they're worth the time, especially in audio form. Absolutely loved this one! It leaves you feeling that the story is finally complete while still leaving room for it to continue. Always love John McDonough reading this series too. Awesome in every way! As with all of the Mitford books, this one felt like a visit with cherished friends. Jan Karon does not disappoint. Many readers expressed an inability to identify which character was doing the speaking, but I did not have this problem at all. I am a long time Mitford fan, and can identify these characters as easily as I can my own family. I would not recommend this is as a stand alone novel, as the joy would be lost if the reader does not know the precious story of Lace and Dooley and their respective families. I have read and listened to all of the Mitford books time and time again, and they always bring me pleasure. John McDonough excels once again. He is the voice of our beloved Mitford. In Come Rain or Come Shine, Jan Karon, in her typical loving, gracious way, gently eases us into the next generation. Those of us who adore Father Tim will find that fact somewhat bittersweet. I find myself eagerly anticipating the next book to see what direction Jan decides to take. Ms. Karon has done it again! Great segway into Dooley and Lace! Hoping for another book on Meadowbrook Farm. As usual I want more! I'm guessing that all readers of the Father Tim books having been waiting for this book for a long time. while it was wonderful to find out how "it" happens, it was also to much at one time. I felt like Ms. Karon was but three books of info into one. That being said, I couldn't stop myself from listening to it almost straight thru. One of the joys of a series book is wanting to know what the characters have been up to since you last saw them. 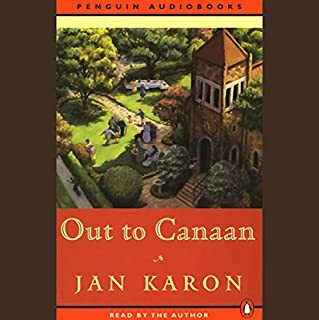 Reviving some of the familiar residents of her previous 10 Mitford novels and adding a few new characters, Jan Karon created a lump in my throat by describing the day by day preparation for and the ceremony of a simple country wedding. Inspiring story that tells us all how we should behave, respect each other, and give unconditional love. The story got off to a slow start but still deserves 4 stars. This series always grounds me and I would recommend it to anyone that would like to savor a beautifully narrated, thoughtfully written story about a community of people that have grown together as they help each other through their struggles. What other book might you compare Come Rain or Come Shine to and why? I have enjoyed all of the Unabridged Mitford Books read by John McDonough. One of the best books in Mitford series. Jan Karon did an excellent job of bringing the threads of the many characters' stories come together. John McDonagh makes the story come alive. Precious climax and celebration of Father Tims belief in and love for humanity. What goes round comes round. His investment of love and self flowers into family and joy for all. Wonderful, fitting narration. I am a better person after visiting Mitford. Loved this story. Well written, well read. A beautiful, gentle, everyday story about everyday life with its joys, sorrows and surprises.